The City of Calgary and surrounding metropolitan area is home to more than 1 million people (2005 Statistics Canada). 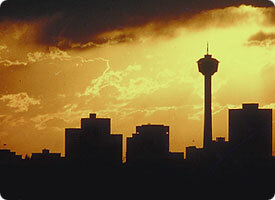 Calgary is the largest city in Alberta and the third largest city, by population, in Canada. It is the largest Canadian metropolitan area between Toronto and Vancouver . Calgary's is starting to become recognized as one of Canada's most diverse cities. Calgary is a modern cosmopolitan city that still retains much of its traditional culture of hotel saloons, western bars, night clubs, and hockey. Following its revival in the 1990s, Calgary has also become a centre for western music in Canada. As such, it is referred to by some as the "Nashville of the North". As a relatively ethnically diverse city, Calgary also has a number of major multi-cultural areas. It has one of the largest Chinatowns in Canada as well as a Little Italy in the Bridgeland neighbourhood. Forest Lawn is among the most diverse areas in the city and as such, the area around 17th Avenue SE. within the neighbourhood is also known as International Avenue. The district is home to a wide variety of ethnic restaurants and stores. The downtown region of Calgary consists of five neighbourhoods: Eau Claire, the Downtown West End, the Downtown Commercial Core, Chinatown, and the Downtown East Village. Distinct from downtown and south of 9th Avenue is Calgary's densest neighbourhood, the Beltline. The area includes a number of communities such as Midtown, Victoria Crossing and a portion of the Rivers District. Adjacent to, or directly radiating from the downtown are the first of the inner-city communities. These include Crescent Heights, Sunnyside, Hounsfield Heights/Briar Hill, Hillhurst, Bridgeland, Renfrew, Mount Royal, Mission and Inglewood. The inner city is, in turn, surrounded by relatively dense and established neighbourhoods such as Rosedale and Mount Pleasant to the north; Bowness, Parkdale and Westgate to the west; Park Hill, South Calgary (including Marda Loop), Altadore and Killarney to the south; and Forest Lawn/International Avenue to the east. Lying beyond these, and usually separated from one another by highways, are the suburban communities. In all, there are over 180 distinct neighbourhoods within the city limits.